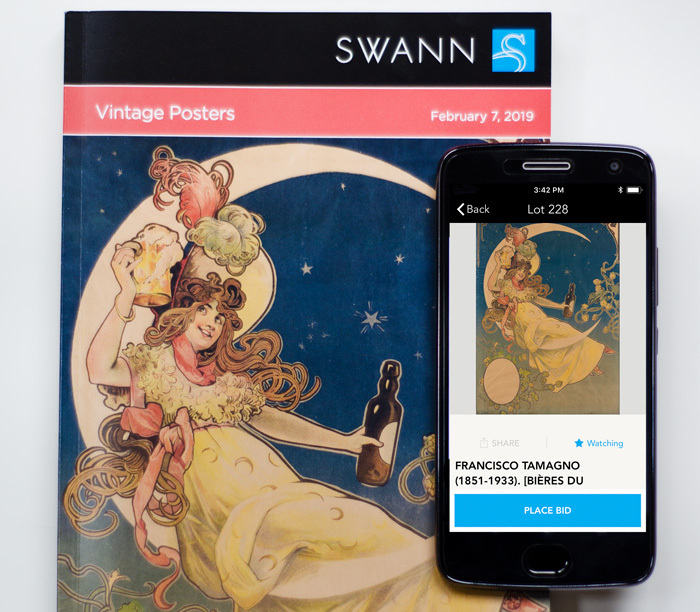 Live online bidding is seamless with Swann Galleries’ App, where you can browse catalogues and bid live, with no extra fees. Another bonus? 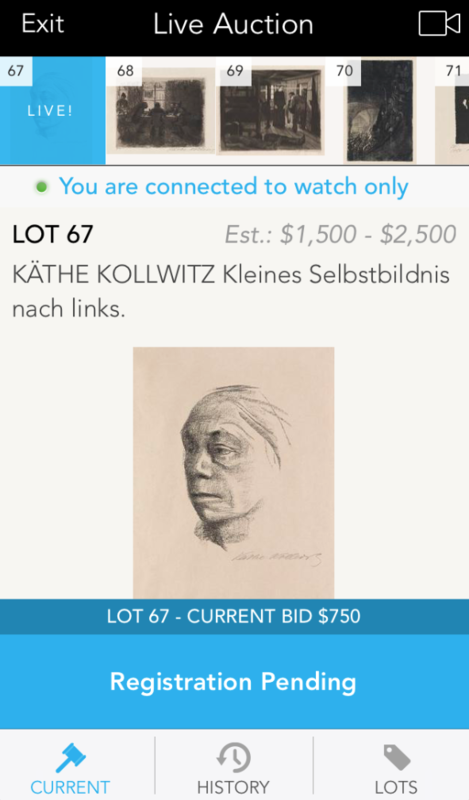 You can watch lots, place absentee bids, and opt in to push alerts for auction reminders. Get it from the App Store or on Google Play. 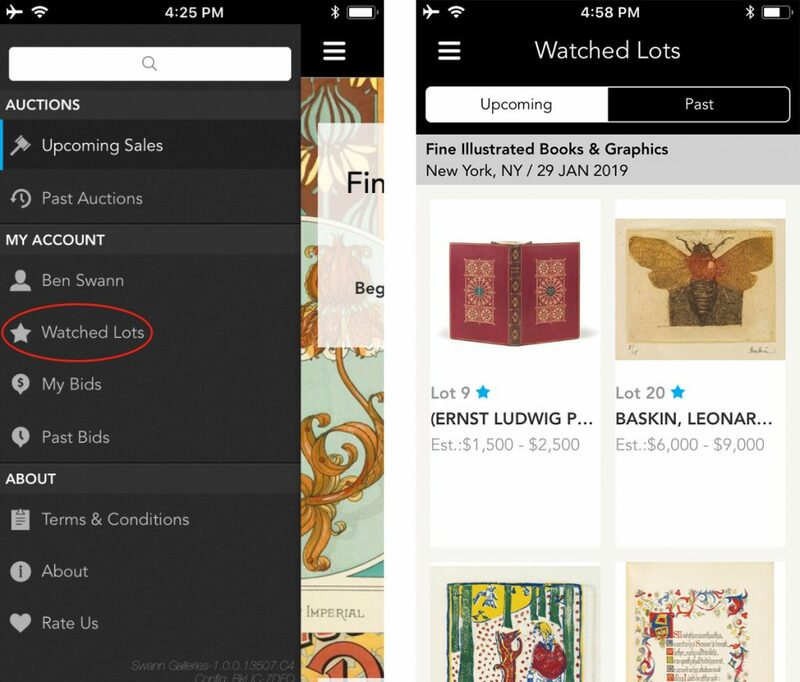 You need to set up an account on the app in order to bid and watch lots. If you already have a Swann Client Account, a separate service on our website, you will need to sign up again for the app. We recommend using the same credentials for these accounts. Catalogues are published to the app shortly after they are posted to our homepage. 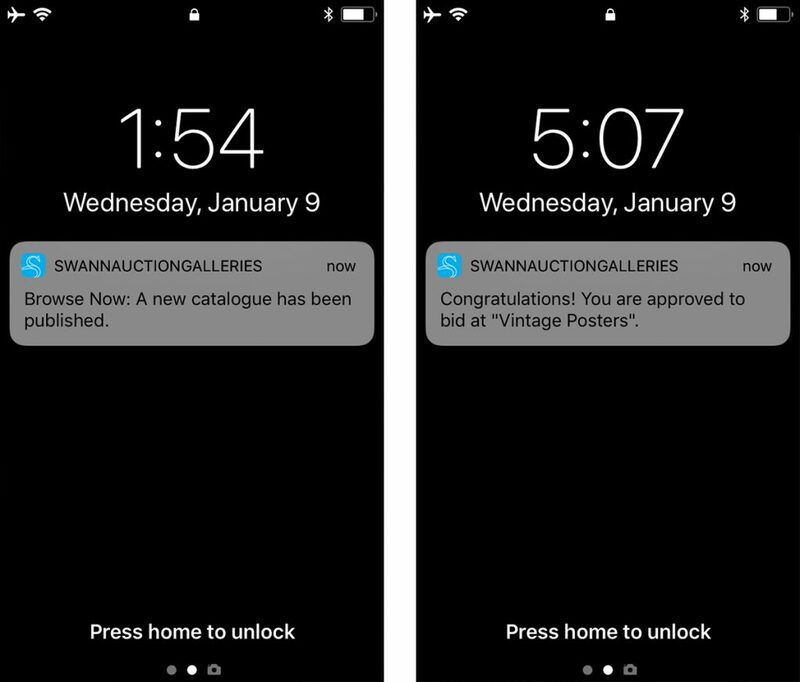 A push notification will go out after each catalogue is published to the app. Use this tool to bookmark items of interest. How to: Navigate to a lot information page inside a catalogue, and tap the star beneath the image. Once you’ve successfully bookmarked the lot, the star will turn blue and appear next to each bookmarked lot number. Left: Lot information page. The “Watch” button is located directly beneath the images for a lot. Right: A cyan star indicator that the lot has been successfully bookmarked. Where are my Watched Lots stored? Go to the app navigation menu and find Watched Lots underneath My Account. You need to be signed into your account to access this section. You must register before each auction to bid. A complete address and telephone number is required to register. All auction registrations are subject to approval. You will receive a confirmation email once approved. This may take some time, depending on the status of your account and whether or not you have bid with us before. Please register in advance. Tip: Enable push notifications for quick alerts about your registration status. We reserve the right to set a bid limit. To request a bid limit increase or find out if we’ve placed a limit on your registration, contact live@swanngalleries.com or call (212) 254-4710. 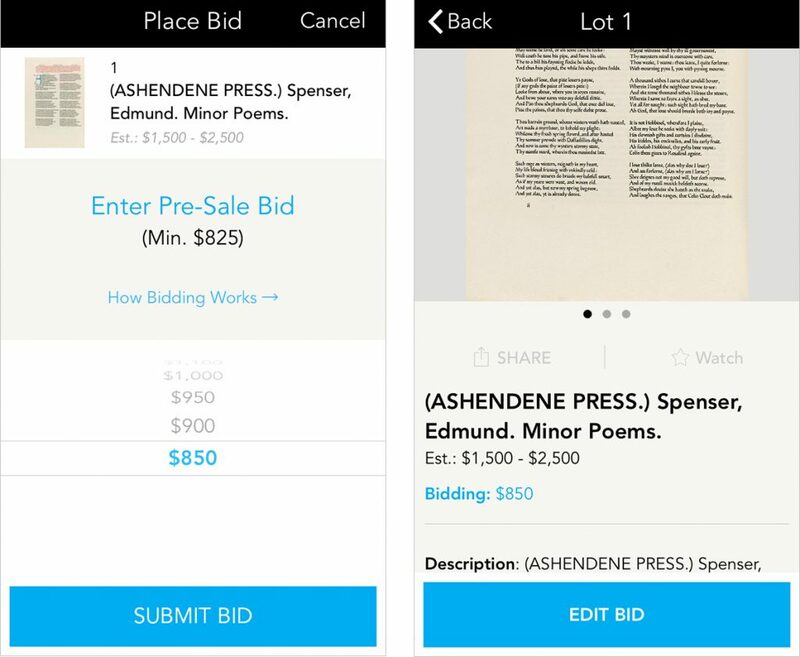 Bid in advance, manage or edit your current bids and keep track of past bids, all within your account on the app. Important! Bids placed using our Client Accounts, a separate service, will not be reflected on the app, and vice versa. Where do I keep track of my bids? 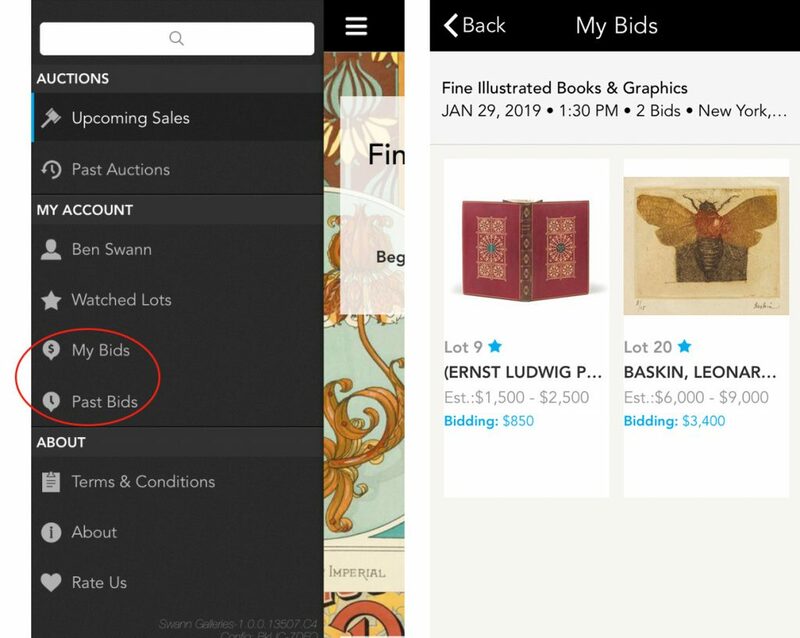 Go to the app navigation menu and find My Bids or Past Bids underneath My Account. You need to be signed into your account to access this section. Bid live from your phone as though you’re right with us in the room, with no extra fees. 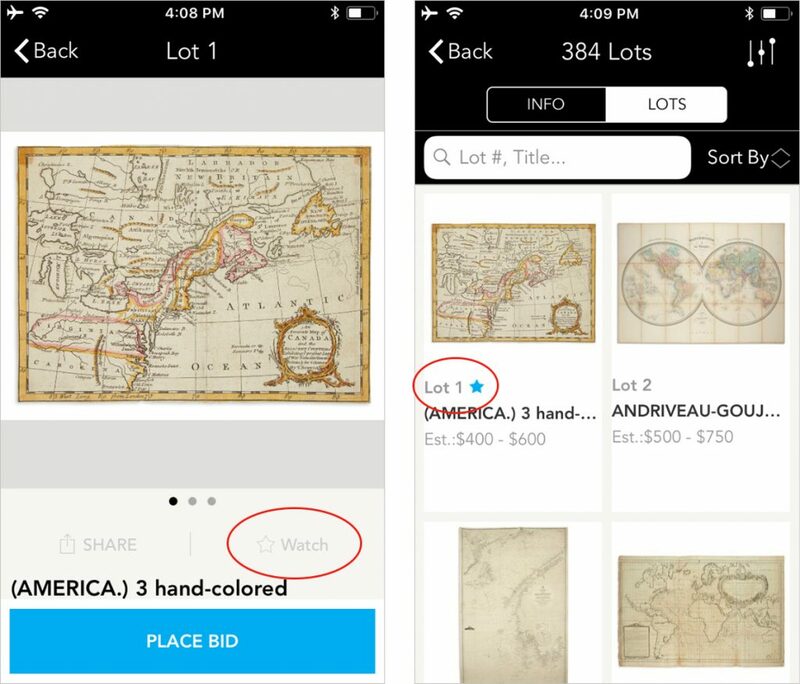 A dedicated clerk will relay bids from the app to the auctioneer on your behalf. If you register during the auction, and it is approved while you are watching the livestream, you will need to refresh the app or re-join the live bidding room in order to bid. The message at the bottom of the screen may linger on “Registration Pending” even after you’ve been approved, so be sure to check your email or refresh the app. This is what it looks like after you register to bid while watching the livestream. Once you are successfully registered and approved to bid, join or re-join the live bidding room. You will need to slide the toggle at the bottom of the screen, and confirm, in order to place your bid. Tip: Your official paddle number is located at the top of the screen. Turn on the video and audio livestream for an enhanced live bidding experience. 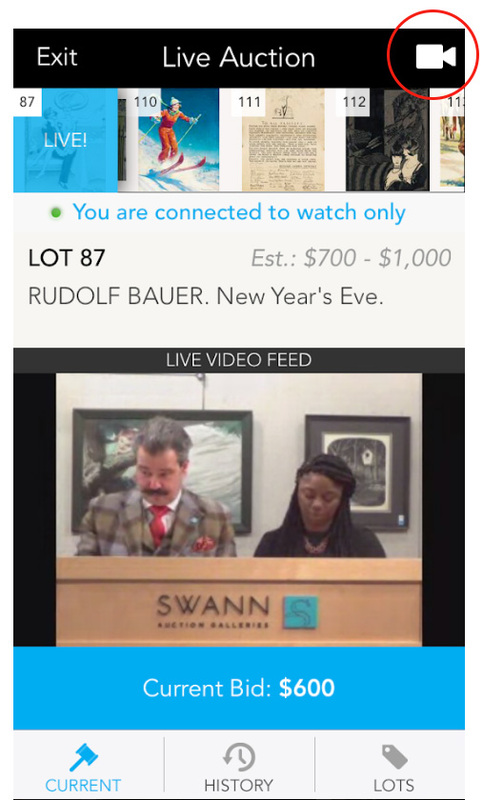 The livestream toggle is located in the upper righthand corner of the live bidding room. Tip: Make sure you have a clear connection. Poor reception or wifi will adversely affect the quality of the livestream, as well as your live bidding experience. Want to watch the livestream without registering to bid? That’s fine! However, if you are interested in possibly bidding, we recommend doing so well in advance, since approval can take a few minutes and we’d hate for you to miss out on something great. Alerts are sent out shortly after each catalogue is published, on auction day, and when you registration has been approved. These are helpful, but optional. 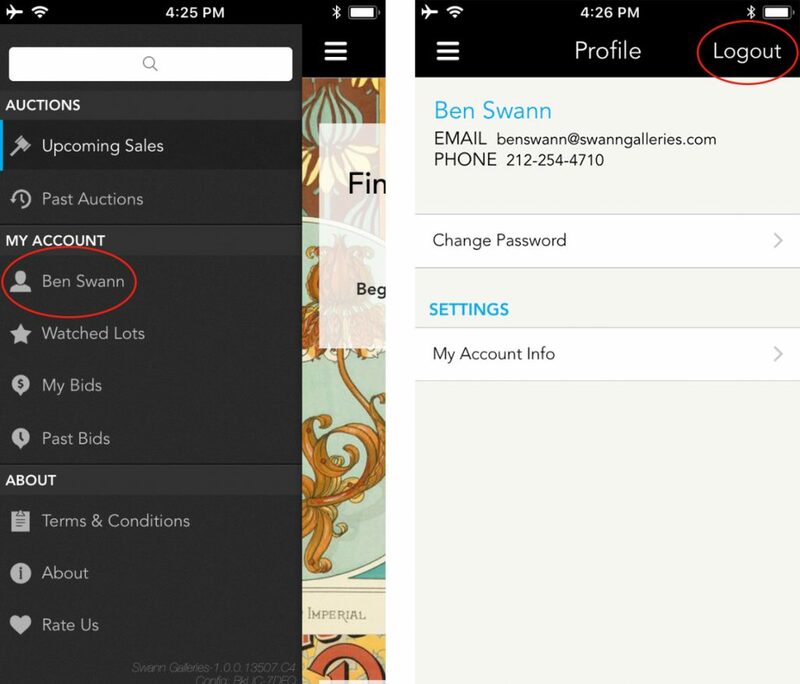 Select the Swann Auction Galleries app from the general Settings menu on you device. Navigate to Notifications, and toggle on or off (see below). Now, how do I log out? 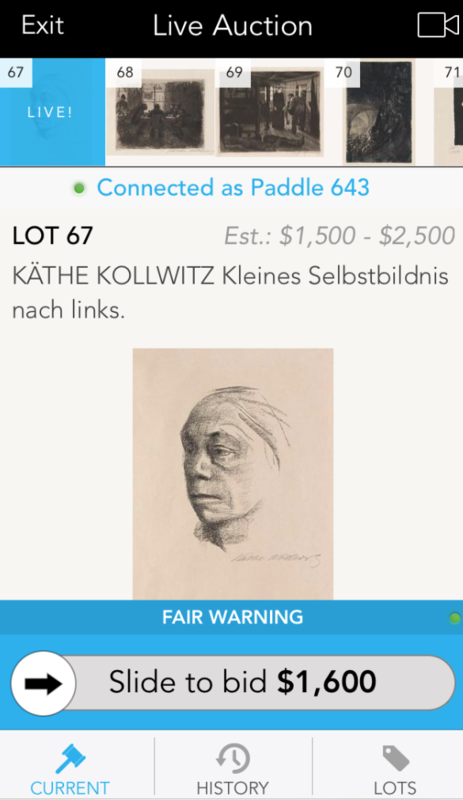 If you’re the only bidder using the app, you shouldn’t need to log out. However, if you do, the logout button is located in the upper righthand corner of your account profile page, pictured below. The logout button, located in the upper right corner of your account profile page. 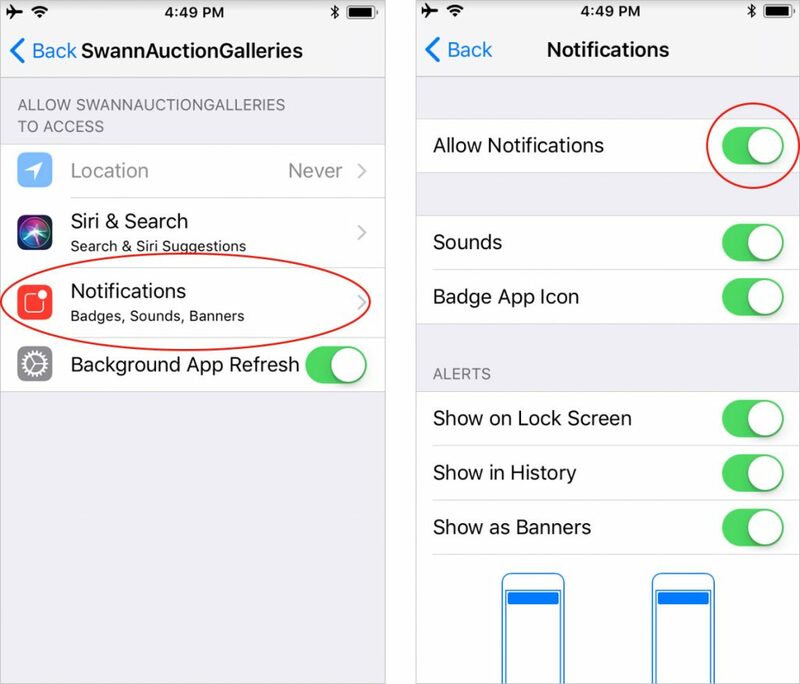 If you have further questions about Swann Galleries’ App, check our FAQ or contact us directly. Help us make our app better: take a moment to send us your feedback. November 7, 2013 Where in the World is Nicholas D. Lowry?